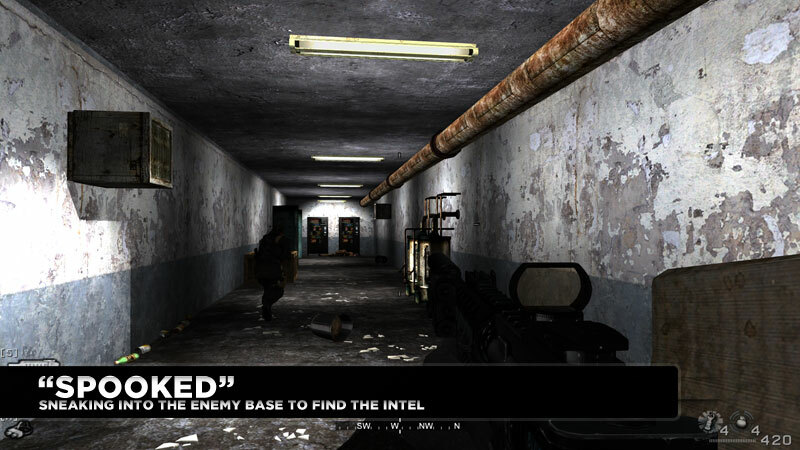 This single player level takes place in an alternate timeline where instead of executing Gaz, Zakhaev captures him to torture information out of him. A U.S. CIA agent has informed the SAS that an Ultra-nationalist controlled building in Petropavlovsk, Kazakhstan contains information regarding Gaz’s location. Captain Price and Soap have infiltrated the city and made it to the sewers beneath the building. Can they trust the information from the CIA spook, or is it a trap? The "Spooked" experience is approximately ten minutes. The level is split into two parts: the quiet infiltration section and the high energy rooftop escape. During the rooftop escape, I wanted a chopper to terrorize the player and have them ultimately take it down in a grand finale. 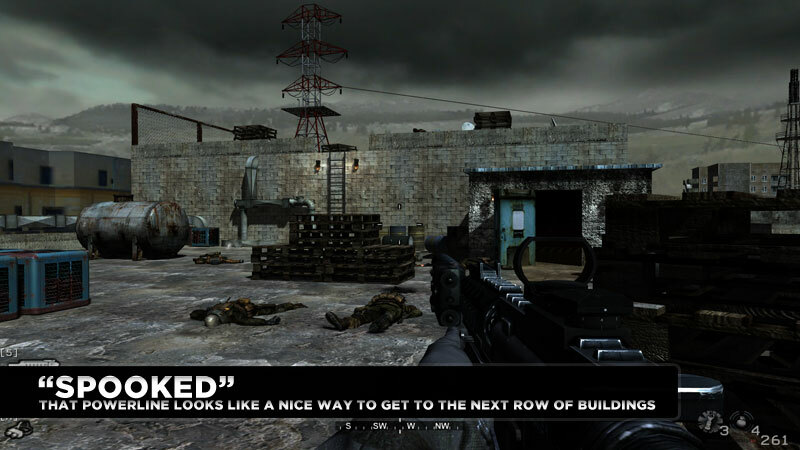 In this level, I reuse a large number of game assets and events like C4 placing and detonation, Captain Price helping you up, Captain Price animations, and of course, all of the enemies, props, etc. 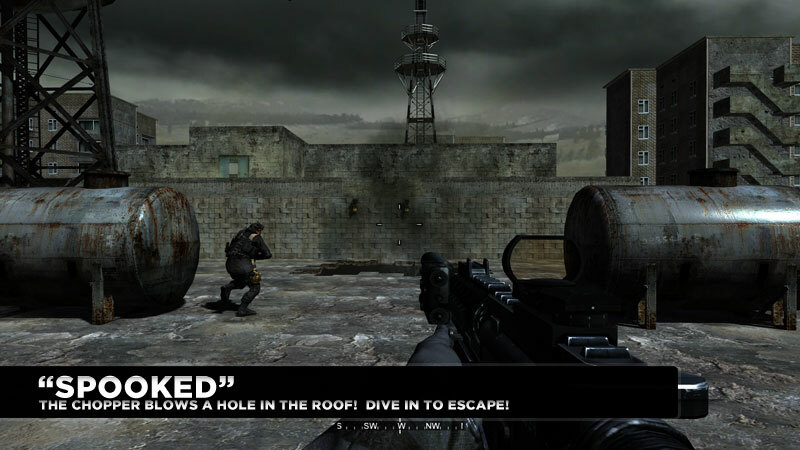 I also scripted custom features such as the zip-line, slow motion (bullet time), and the dramatic finale where the player causes a radio tower to 'karate chop" the helicopter boss. Design and build all BSP level geometry, apply locale appropriate textures, decals, etc. 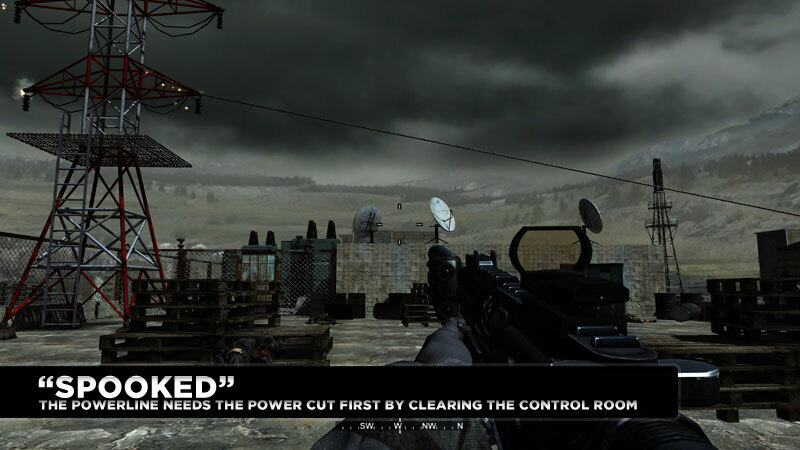 Re-use game special effects such as smoke, electrical sparks, explosions, etc. Light the level using baked and dynamic lights. 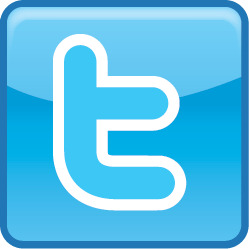 Choose and trigger appropriate music to influence player emotion. 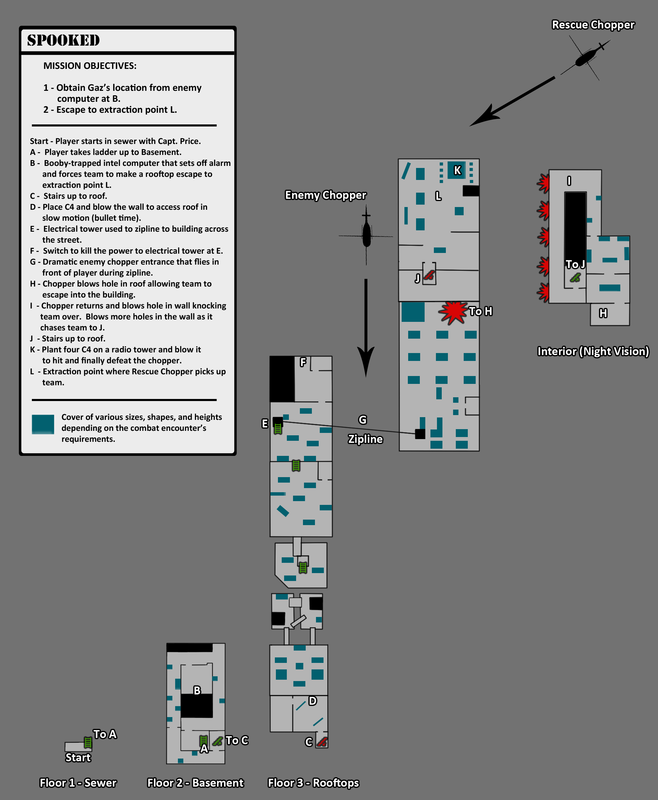 Place AI paths, cover nodes, and enemy spawn points. Ensure that combat encounters draw the player to the proper direction through the level. Write all of the dialog to push the story along. Record voiceovers for Captain Price and Big Bird. Integrate dialog text and voice over recordings into the engine’s localization engine to provide subtitles and voice. 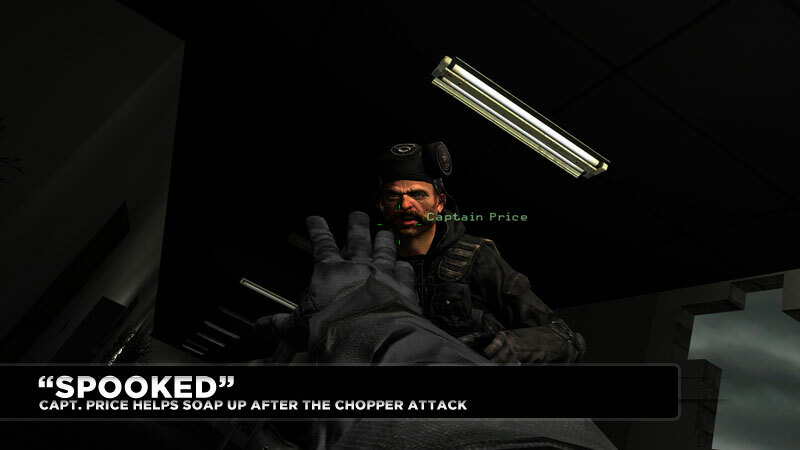 Trigger Captain Price dialog to help guide players through the level. 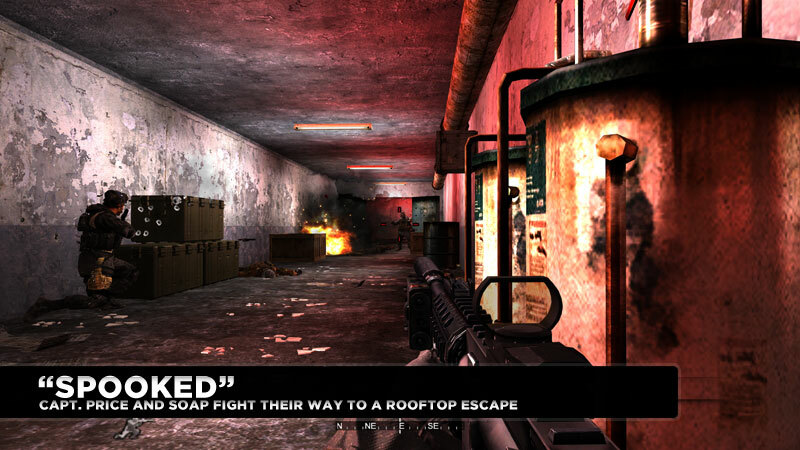 Trapped, players must blow a wall with C4 to escape to the roof. 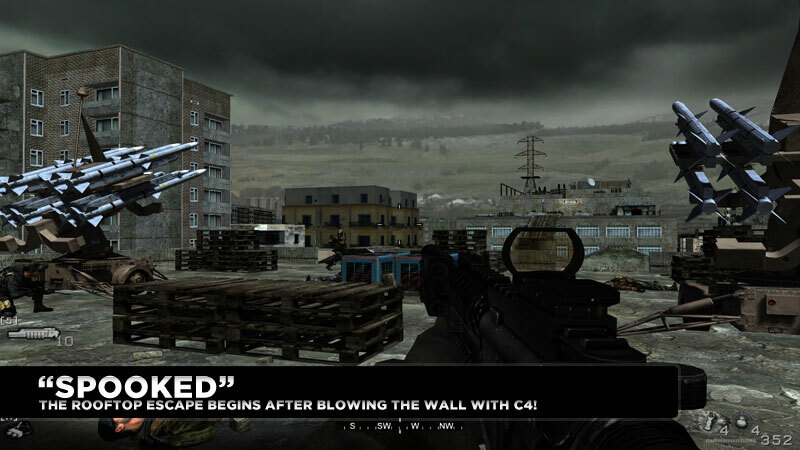 After blowing the C4, the game slows into slow motion for dramatic effect and to allow players to pick off enemies before the next encounter. 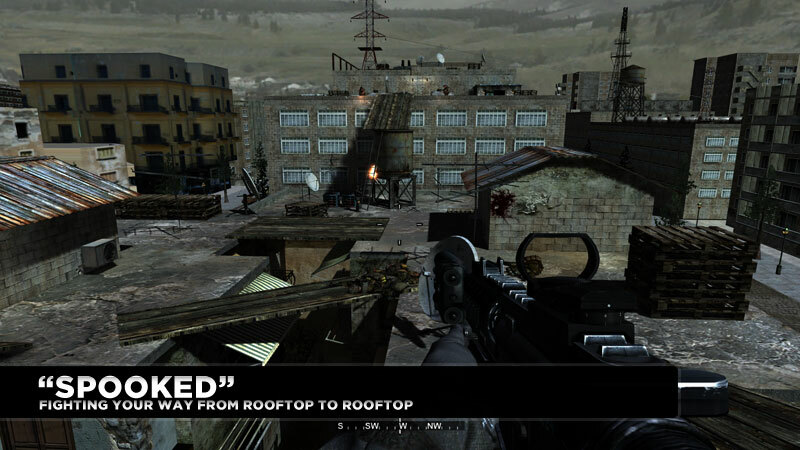 While sliding from one building to another via a zipline, the enemy chopper arrives by flying under the zipline and right in front of the player. The camera shakes and the music changes. When the player tries to duck into stairwell to avoid the chopper, it fires a missile to blow up the stairwell. 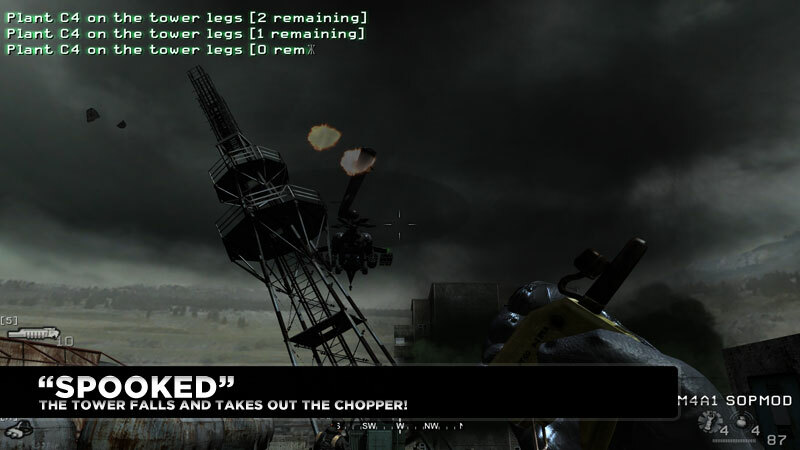 When the player approaches a ladder, the chopper fires a missile that blows a hole in the roof of the building. 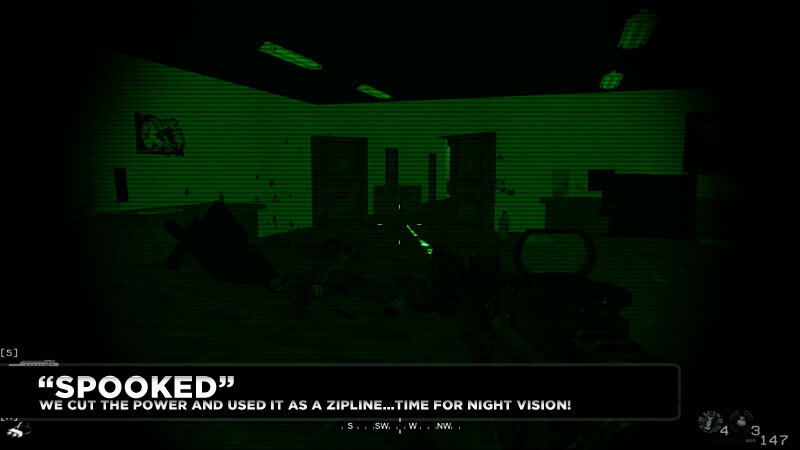 The player and Price jump down to begin the night vision sequence. 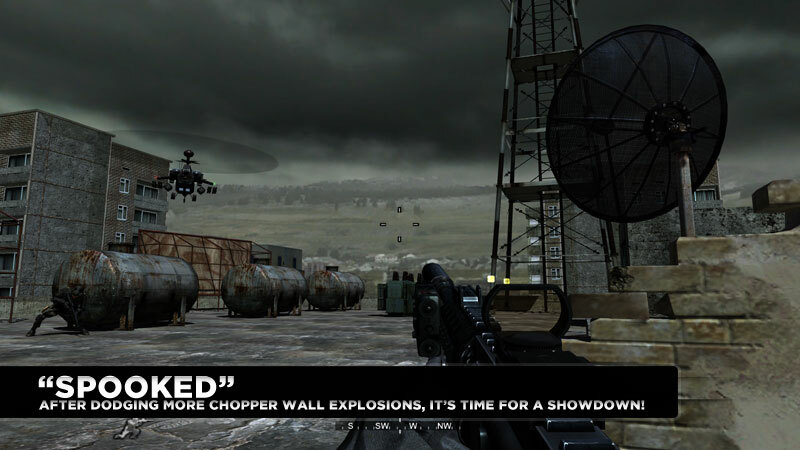 During the night vision sequence, the chopper surprises the player by blowing a hole in the wall and knocking them and Price to the ground. Price pulls the player up and begins a sprint through a hallway. 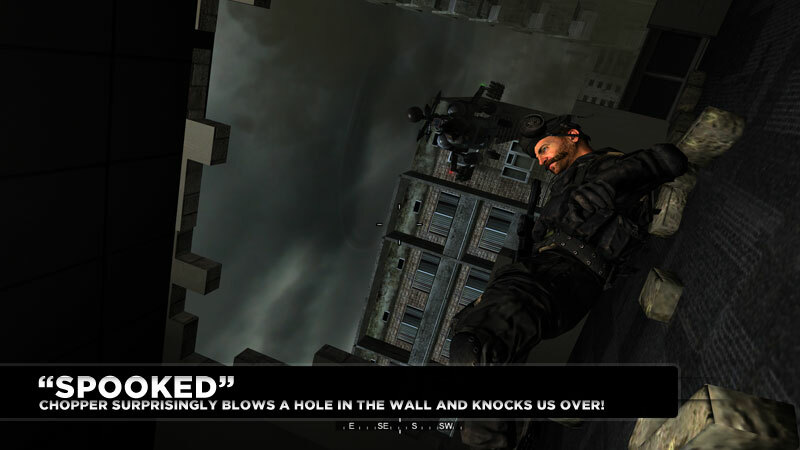 During the hallway sprint, the chopper blows massive holes in the wall next to the player over and over until they reach the end. 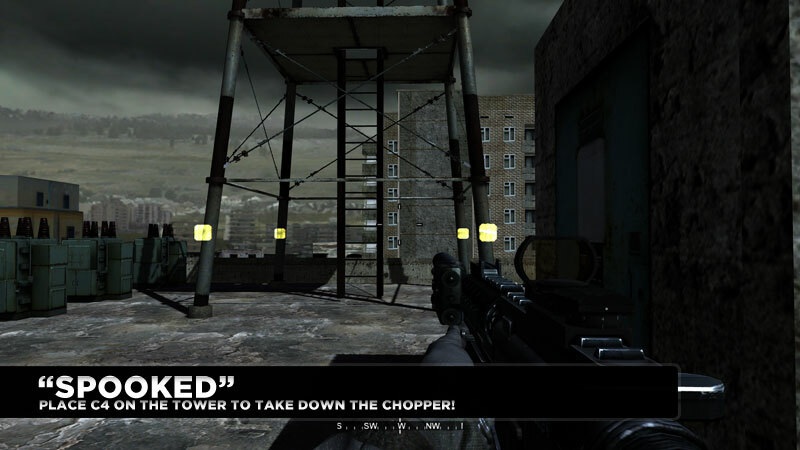 During the final chopper battle on the roof, the player must plant four C4 units on a radio tower. 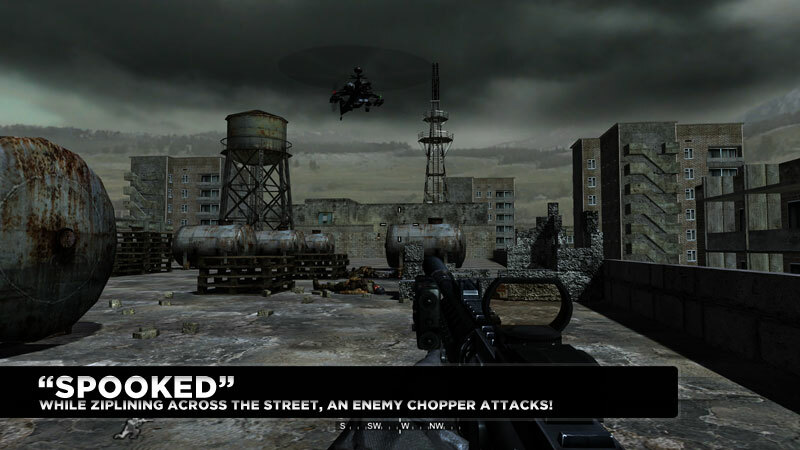 When the player hits the C4, the game goes into slow motion, the camera slowly turns around and up to ensure the player sees the chopper’s demise. As the camera reaches its final position, the game speeds back up just in time for the tower to karate chop the chopper and it explodes and falls to its doom! 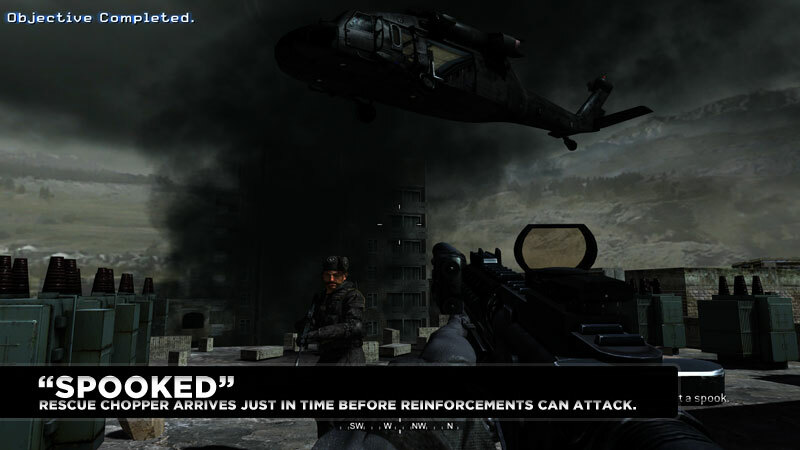 Script the entire level including mission objectives, enemy & ally movement & spawning, the zipline, explosions, enemy chopper movement and attacking, slow motion effect, night vision, etc.